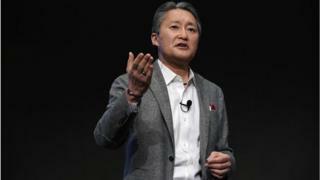 Sony's chief executive Kazuo Hirai is stepping down and handing the reins over to finance chief Kenichiro Yoshida. Mr Yoshida, Sony's chief financial officer, is to take over control of the Japanese electronics giant from 1 April. Mr Hirai will remain at Sony as chairman. Mr Yoshida and Mr Hirai have been instrumental in turning Sony around to focus on smartphone image sensors. Under their efforts, the Japanese electronic giant sold off its struggling PC business and launched the successful PlayStation 4 video game console, which has sold more than 60 million units to date. Sony said its profits quadrupled in the three months to December. The Japanese electronics giant reported a record profit of 351 billion yen ($3.2bn, £2.5bn) for the quarter, compared with 92.4 billion yen in the same period the year before. "As the company approaches a crucial juncture, when we will embark on a new mid-range plan, I consider this to be the ideal time to pass the baton of leadership to new management, for the future of Sony and also for myself to embark on a new chapter in my life," said Mr Hirai in a statement. Mr Yoshida said he wanted to build on the management foundation created under Mr Hirai's leadership to "improve Sony's competitiveness as a global company".